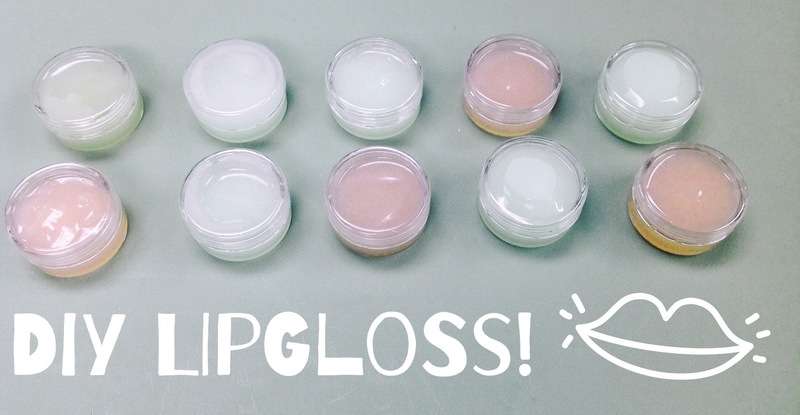 DIY Lipgloss | My Crazy Blessed Life! I get to meet weekly with some awesome high school and middle school girls. We do a bible study, discuss life and sometimes have a quick craft that I can apply to their lesson. These girls are amazing and I am honored to be a part of their lives! For the past few weeks we have been discussing their words and how they use them. This week one of the points of our lesson was to use what we say to encourage and build up those around them. So we made some easy DIY lipgloss as a reminder to have sweet words this week. I melted the coconut oil and petroleum jelly in a double boiler. Then added the tea tree oil (makes it a bit tingly and has antibacterial properties) and vitamin E oil (moisturizing). I gave each girl a small amount in a bowl to mix in their favorite flavor powder drink mix. I had several favors to choose from raspberry lemonade, pink lemonade, lemonade, strawberry kiwi and mango tea. The girls really enjoyed mixing up their own gloss and pouring it in the tiny containers. I provided edible glitter also since I have some from all of my cake baking. You can get it in a craft store in the baking section. They turned out cute and each girl took two little pots of lipgloss home with them 🙂 Thanks for stopping by! And it’s such a nice little gift ! I used sam’s and wondered how it was made! I am a high school teacher and am in charge of an advisory group of 12 10th grade girls. It is really hard to find something that is age appropriate, cute, useful and most of all, inexpensive! This idea really fits the bill. Thank you!